Being Farmed in the Northwest? Earlier this month, a net pen broke apart near Washington state's Cypress Island. The pen held 305,000 Atlantic salmon, a non-native fish. 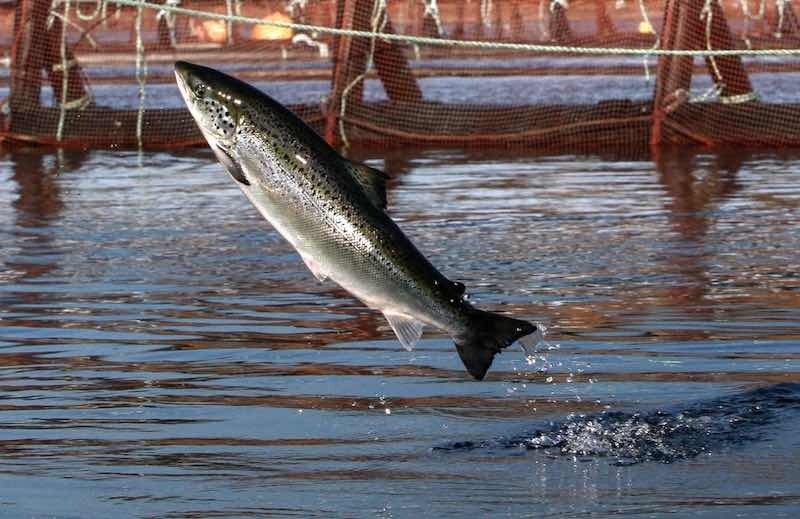 The company that owns the pen, Cooke Aquaculture, says it is unsure exactly how many Atlantic salmon escaped, but the state estimates between 4,000 and 185,700. Cooke and the Washington Department of Fish and Wildlife are trying to collect and count the fish that did not escape to get a better handle on how many broke out of the pen. The company initially cited the solar eclipse and high tides for the pen's failure, but tidal currents were not abnormally high when the pen broke apart. In fact, Cypress Island has seen higher tides every month this year. Penalties for the company are still being figured out. The escape raises concerns from environmentalists worried about pollution and diseases from the farmed fish. The Lummi Nation Indian tribe declared a state of emergency out of concern for endangered salmon spawning grounds. State officials have asked fishers to catch as many Atlantic salmon as they can, with no catch or size limits. The situation has raised a few basic questions about Atlantic salmon and fish farming in the Northwest. Why are Atlantic salmon raised in the Pacific Northwest? Atlantic salmon are not native to the Pacific Northwest. For years, they have been bred to become easier to farm -- they're more "highly domesticated," according to the Washington Department of Fish and Wildlife. Most commercial fish farms raise Atlantic salmon. The WDFW says Atlantic salmon is a "favored species" to farm in cold marine waters because the species grows quickly and consistently, is resistant to disease, and is something people like to eat. Farmed Atlantic salmon are more docile than wild fish. Atlantic salmon also have been bred to more "efficiently turn feed into flesh," says Michael Rust, the science adviser for NOAA's office of aquaculture. What used to cost several dollars per pound to grow, worldwide, now costs about $1.25, Rust says. That makes for higher profits. In the U.S., Washington and Maine are the two largest Atlantic salmon producing states, but they're small beans compared to salmon farms in Canada, Norway and Chile. Atlantic salmon today, Rust says, probably grow twice as fast as when aquaculture first started. Now, most Atlantic salmon is farmed -- less than 1 percent comes from the wild. How long have Atlantic salmon been in Northwest waters? In 1951, the Washington Department of Fish and Wildlife tried to establish wild Atlantic salmon runs in the state. The department hoped to create more salmon fishing opportunities and released Atlantic salmon smolts. The department tried again to establish wild runs in 1980 and 1981. Atlantic salmon were also released into lakes to establish fisheries there. No wild Atlantic salmon returned from any of the releases. Attempts to establish wild runs -- outside of the Atlantic Ocean -- have failed across the U.S.
Research into the use of net pens in Puget Sound and elsewhere started in the 1960s and '70s. At first, much of the research was focused on helping out wild salmon runs on the East Coast. When those efforts worked, a commercial industry started popping up. The first commercial net pens in the Northwest raised Pacific salmon. But because Atlantic salmon have been bred with traits that make them suitable for aquaculture, most commercial net-pen operators now choose to farm that species. Net pens are used in fresh and saltwater fish farming. They're basically large underwater nets used for holding salmon. Washington is the only West Coast state where Atlantic salmon are farmed. Washington has eight Atlantic salmon net pens. There are two types: commercial net pens for raising Atlantic salmon, and enhancement net pens for wild salmon that will eventually be released. The net pen that broke is a commercial type. What's the market for Atlantic salmon farmed in Washington waters? Historically, salmon farming has been a small part of the entire aquaculture industry. A 2001 report by NOAA Fisheries says farmed salmon help meet people's growing appetite for seafood -- farmed and wild salmon are both, well, salmon. Salmon is also well-known as a healthy choice on menus -- fish has been documented to provide nutrients like Omega-3 fatty acids. Atlantic salmon are available year-round, unlike wild-caught fish. And they're cheap to produce. But there's an interesting kink in the salmon farming market: the farm-to-table movement. It's a growing trend, especially in larger markets, to promote wild-caught fish. Advocates say it's better for the environment and better for fish health. Rust says that while the farm-to-table movement is gaining steam, it could have the effect of driving out cheaper options -- pricing out lower-income consumers. He says aquaculture should be considered as a farming option as the world's population grows. "It's going to be important to take a look at food production systems, including aquaculture side-by-side with agriculture, and look at where the resiliencies to climate or exploitations to water and land occur," Rust says. Others worry about the health impacts of eating farmed salmon, which are treated with vaccines. What are some of the biggest concerns about the Atlantic salmon escape? The state has said it is worried about farmed salmon outcompeting native salmon for food and spawning grounds. "[Atlantic salmon] are not normally found in freshwater environments, and that's not a good situation," Ron Warren, WDFW's assistant director, tells KUOW's The Record. Warren says there isn't any evidence so far that Atlantic salmon have spawned or crossbred with other salmon species. Atlantic salmon are actually more closely related to brown trout than Pacific salmon. That's why they don't breed with Pacific salmon -- even when researchers have tried to force it in the lab, Rust says. So far, no Atlantic salmon have established themselves in Pacific Northwest waters, says Ray Hilborn, a professor with the University of Washington's School of Aquatic and Fishery Sciences. "This event is not that unique and so far no Atlantic salmon escapes have established self-sustaining populations or caused known damage to wild stocks," Hilborn wrote in an email. "This isn't to say it is not a concern, nor that we shouldn't carefully consider whether we want salmon aquaculture in this region, but to call this a disaster is a stretch." Researchers say, typically, farmed Atlantic salmon don't survive well in the wild because they're used to being fed. Kurt Beardslee, the director of the Wild Fish Conservancy Northwest, says he is concerned about the environmental effects of this release -- and of net pens in general. "The Atlantic salmon bring with them pollution, virus and parasite amplification, and all that harms Pacific salmon and our waters," Beardslee says. According to a NOAA Fisheries report, escaped farmed salmon that carry diseases have a relatively low risk of spreading them to wild fish. This is because pathogens are already present in the water, and escapees likely won't be infectious enough to contaminate healthy wild populations. Escaped fish also aren't very fit, so they are often quickly eaten by predators. This event is an example of issues with net pens -- and should be a wake-up call, Beardslee says. The same company, Cooke Aquaculture, is proposing a larger Atlantic salmon net pen in the Strait of Juan de Fuca. The Wild Fish Conservancy Northwest is circulating a petition opposing the proposed net pen. Beardslee says that net pens are polluting every day, which to him is a major worry. "It's basically a feedlot of salmon that are in a very contained area. They're all feeding at extremely high rates so they can raise them to adulthood quickly," Beardslee says. "They're producing lots of waste materials, and that waste is pollution." Why Are Atlantic Salmon Being Farmed in the Northwest?